Joseph S. Myers has compiled a tiling database of interesting tilings possible with polyominoes, polyiamonds, and polyhexes. Erich Friedman: I've made a page of Polyomino Addition Problems. The first two are surprising! They might make good puzzles for your readers. A large variety of new sudoku variations is on display at hexapuzzle.com. Various new metal puzzles have been minted by Hanayama, and are available at Puzzle Master. All of them are exquisitely made, and feature only 2 to 4 pieces. 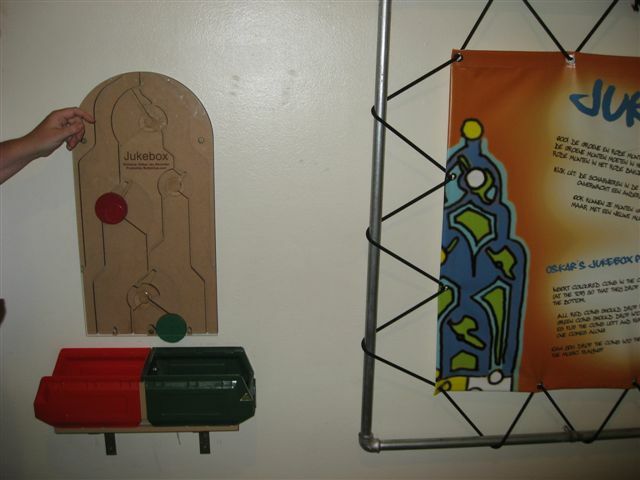 Some of the newer puzzles are Oskar's Cuby puzzle, and Serhiy's Coaster puzzle. Seppo Mustonen: During the past 45 years I have made statistical software, one of them being the SURVO MM (Survo) package, which is a general environment for statistical computing and related areas. As an application of some special computational features (especially those related to combinatorics) of Survo I got an idea of cross sum puzzles having something of the flavour of Kakuro but with unique and mathematically challenging features of their own. I call them Survo cross sum puzzles or Survo puzzles (link to PDF). As an example, arrange the numbers 1 to 12 in the grid below so that the rows and columns sum to the given numbers (problem 10 on page 24). Back in 2003, Perelman proved the Poincare conjecture. After several years of study, his proof has been accepted. An excellent report on the full story is given in The New Yorker story, Manifold Destiny. Another Fields medal winner is Terence Tao. 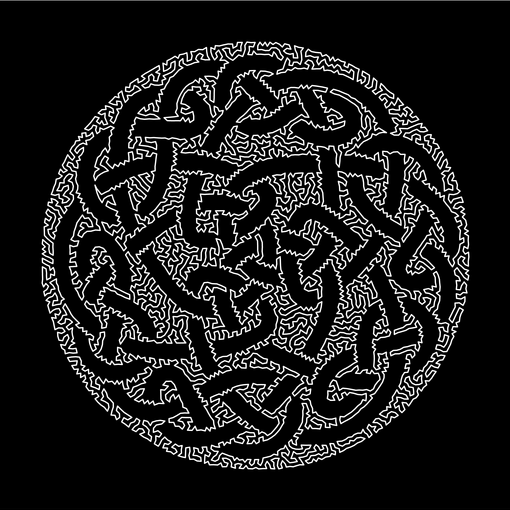 There are new logical mazes available at Andrea Gilbert's clickmazes.com. Oskar: When writing the challenge generator for the Active Maze, I discovered that I could not use a genetic algortithm, as even changinging the color of only one square would change the entire maze. I wonder whether there would be any intelligent approach to such generator, other than brute-force search. Many combinatorial objects are explained at the Combinatorial Object Server. The Davis Megamaze (in Sterling, Mass.) 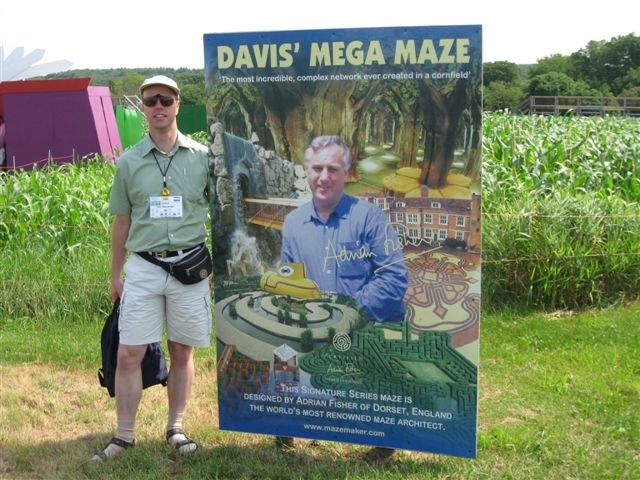 is a huge cornfield maze designed by Adrian Fisher. A feature of the maze, in addition to the many bridges, is a series of gates which allow for 24 different mazes. The honor system prevents a person from passing through various gates. Oskar sent a photo. Aerial shot. I saw the movie with a rowdy crowd, and had a great time. More importantly, I did a survey of some of the snake-related 2-dimensional puzzles I knew about for my latest maa.org column, Snakes on a Plane. An excellent snake-touching puzzle was posted on newsgroup rec.puzzles. Next, Serhiy Grabarchuk's snakes will be the subject of the next Al Zimmermann Programming Contest. Win $500 by putting big snakes in planar areas. One puzzle I wasn't able to solve involved edge crossing. In a thrackle, each edge crosses all non-neighboring edges. John Conway offers $1000 for a thrackle with more edges than vertices. I tried to wrap my head around the problem. 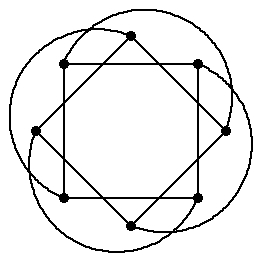 In a planar graph, none of the edges cross each other. Each edge crosses 0 others, so let me call that writhing-0. What graphs are writhing-1? That is, what graphs have the property that each edge crosses exactly one other non-neighboring (a neighboring edge is one that shares a vertex) edge? Edges can't cross themselves, either. One example of writhing-1 graphs is a planar graph and its dual. Is the cube graph (the edges of a cube) writhing-2? I spent awhile trying to bend the edges in various ways, and the best solution I found cheated (below). Three of the crossings involve neighboring edges. Erich Friedman found a writhing-2 drawing of the cube with no cheating. Can you match him? Answer. What other simple graphs are writhing-1 or writhing-2? Apple has a nice write-up on my colleague Michael Trott. Illustrated is what happens when you drop a pebble into a torus of water. Many of you are members of the Mathpuzzle group. I just learned of the Tough Puzzles group, based on the UK magazine of the same name. The American Institute of Mathematics is in the planning stages for Morgan Hill, CA. A video tour is available - the architecture is amazing. The courtyard is very similar to the Alhambra, a famous site for tiling designs. Escher pretty much started there, copying the tilings into his sketchbook. The Incredible Machine is a collection of openings for the japanese educational show Pythagorus Switch. A longer film is available at Google Video. Michal Stajszczak: I have prepared a new (I hope) variant of sudoku: "anti-knight sudoku". It is standard sudoku with one more condition: the same numbers are not "knight move connected". David Cantrell and Mark Beyleveld have continued to make Heilbronn records. For the 16-point problem, coordinates of the points are exactly (2/31, 0), (29/31, 1), (23/31, 0), (8/31, 1), (0, 10/33), (1, 23/33), (1, 2/33), (0, 31/33), (8/31, 4/11), (23/31, 7/11), (10/31, 2/33), (21/31, 31/33), (21/31, 10/33), (10/31, 23/33), (29/31, 4/11), (2/31, 7/11). Issue 44 of the Games and Puzzles Journal is out. In this issue, the history of covering blocks with polyominoes. Bob Hearn: I've decided to make the current Subway Shuffle prototype publicly available, via www.subwayshuffle.com. As before, the program requires OS X 10.3. Your readers might be interested in these puzzles. The sliding-coin puzzles you posted earlier are included as special cases of the subway puzzles. From the site: Subway Shuffle is a collection of puzzles set in a subway system. You have boarded a car on the Red Line, and your task is to reach your destination. The problem is, there are other subway cars in your way! Each subway car can move only on its own color line: the red cars on the Red Line, the blue cars on the Blue Line, etc. Can you shuffle the cars from station to station, eventually moving your own car to your exit station? Oh, and by the way, I've finished my Ph.D. thesis, "Games, Puzzles, and Computation". M. Oskar van Deventer: Recently, the Museum of Technology Delft commissioned Peter Knoppers and me to build a large sample of the Jukebox puzzle. Because of the ball bearings in the switches, this big 300x600 mm version runs as smoothly as the electronic clickmazes version. 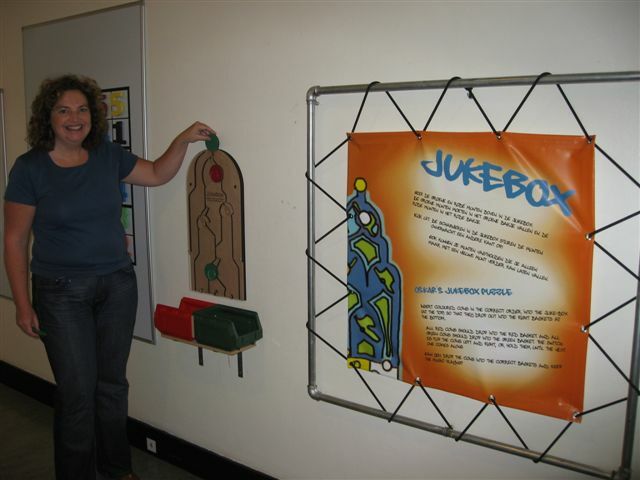 The two photos show the Jukebox puzzle, a big canvas with explanatory text and Liesbeth van Hees, who is responsible for the math collection of the museum. Another picture. 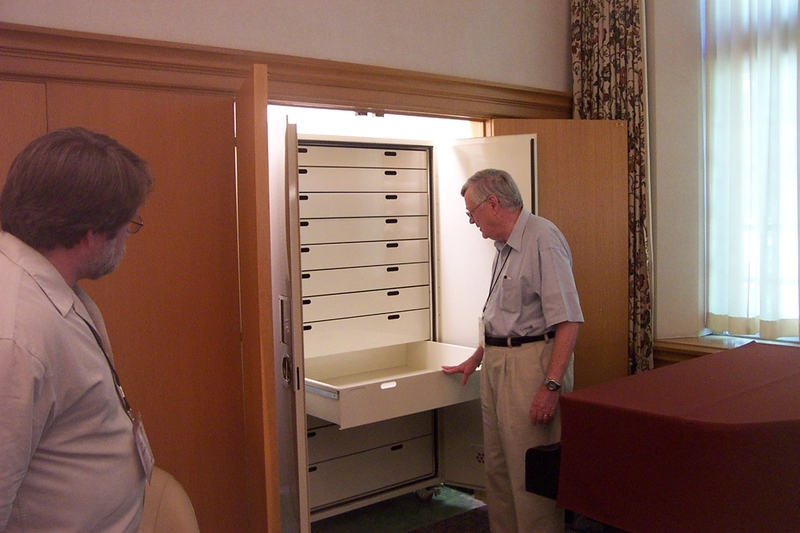 As mentioned in the NYT, Indiana University news, IDSnews, and at the new Jerry Slocum Mechanical Puzzle Collection website, one of the world's largest puzzle collections has been placed on permanent display in the Lilly Library. 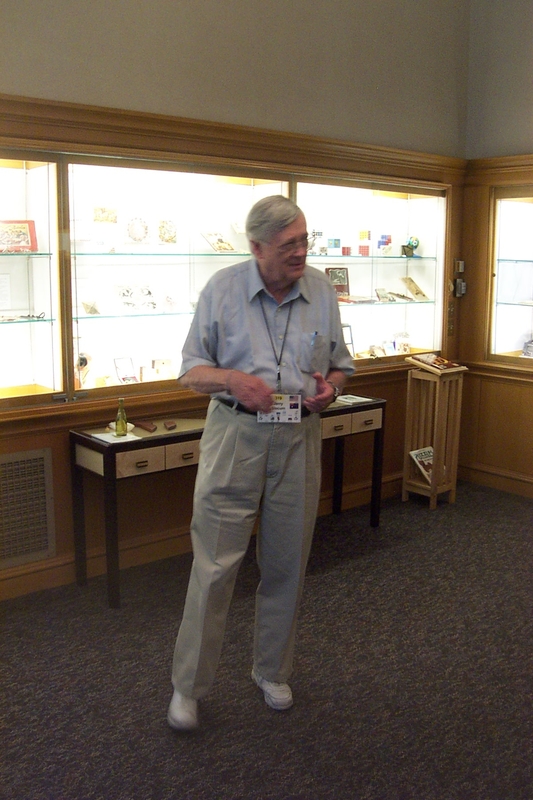 Not only are Jerry's puzzles available for researchers, his collection of puzzle books is also available. 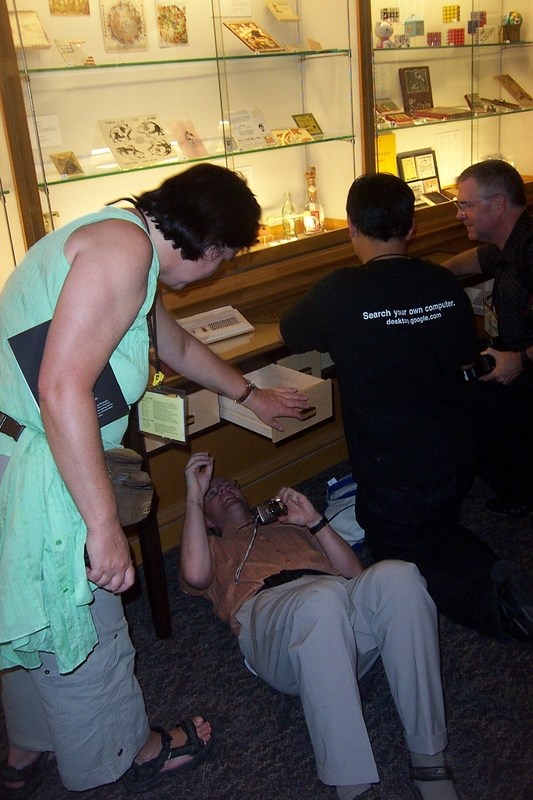 I went to the grand opening, and have pictures of Jerry showing future storage, Jerry near a puzzle table, a puzzle box display, more puzzle boxes, 2-D put-together puzzles, 3-D put-together puzzles, close-up of a 3-D puzzle, the puzzle room plaque, and Wei-Hwa Huang and Oskar van Deventer - solving a puzzle table. Those with personalized Google homepages can get Wei-Hwa's puzzle module. He's recently built a homepage for past puzzle modules. I announced a Vector Math Poster contest a few months ago. 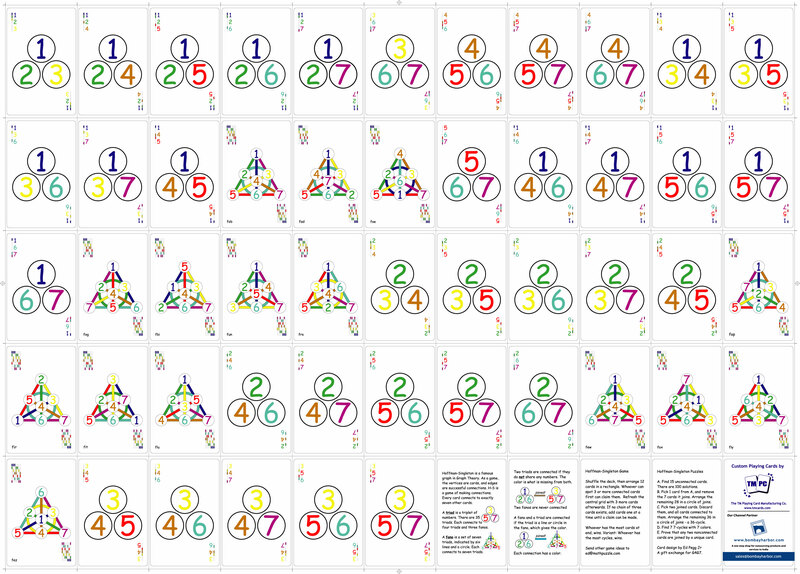 The winner is Peter Esser, who sent me two gorgeous posters: pyramids (SVG, 40 KB), and 24-colored triangles (SVG, 2 MB). The runners up are John Dalbec, for Star Sudoku (pdf file and ps source), and Alexandre Owen Muniz for the SVG Pentominous Puzzle(below). Erich Friedman's Rigid Circle Packings page has gotten a lot of improved solutions recently. But are all of these new packings really rigid? For now, they seem to rigid. A great little mathematical song "Where are the Zeroes of Zeta?" John Derbyshire sings this Tom Apostol song. Theodore Gray has teamed up with the Guardian newspaper to show how all the alkali metals explode. It's myth that cesium is the nastiest reaction. The huge atomic weight of cesium means that an equal weight of sodium releases 132.90/22.98 = 5.78 times as much hydrogen. Cesium doesn't allow much build-up of hydrogen, whereas sodium ignites hydrogen after it has time to accumulate. Theo also got a nice photo of sodiumized bowl of water. Theo is also offering an ultimate periodic table poster, see the bottom of his alkali metal bangs page for sign-up details. Careful out in there. Handbook of Mathematical Functions author Milton Abramowitz mowed his lawn in 1958, passed out in the heat, and died. That left Irene Stegun in charge of the project. Highlights of the ensuing story are at the bit-player blog, and in “Irene Stegun, the Handbook of Mathematical Functions, and the Lingering Influence of the New Deal,” by David Alan Grier, The American Mathematical Monthly, Vol. 113, No. 7, August-September 2006, pp. 585-597. NIST is working on a replacement. Mathpath was recently mentioned in the WSJ (Sat 7/29). Here is their entrance exam (pdf). The 2006 Bridges Exhibit of Mathematical Art has some really nice mathematical art. I particularly like: Bead blasted stainless steel, Poincaré FishDish (Carlo Séquin), Aggregation 27, Fractal Knots No. 2, and Niji (sudoku quilt). Eric Shamblen: I thought you might like to know about some recent additions to the Puzzle Monster website. In Buried Treasure, your goal is to find the locations of 9 treasure chests on a 9x9 grid. Your only clues are the positions of skulls on the grid, placed so that 1 chest is within 3 squares in a direct line and another chest is at least 4 squares away in a direct line. The Transfigurator is a simple visual logic puzzle. Shown six transfigurations from one shape to another, deduce what the seventh shape will become. Both of the above links are updated daily with new challenges. 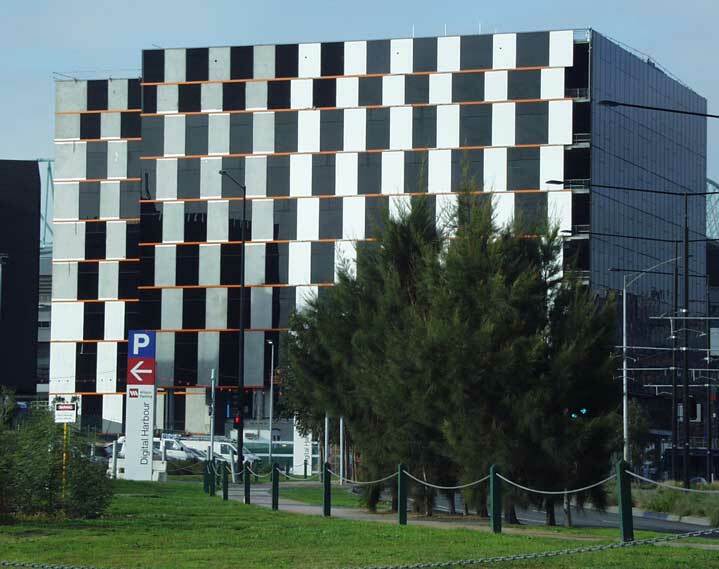 Chris Lusby Taylor: Thought you might like this picture of a building I saw in Melbourne last week. A very simple but a very effective cafe wall illusion. I'm afraid I know nothing of it. I took this snap from a taxi to the airport. George Sicherman: I finally made some progress with V pentomino oddities. Ironically, I had to find a quadrirotary before I found a birotary! Thane Plambeck: I just finished a little project for Tom Rodgers and AK Peters, Ltd. to put the entire book The Mathemagician and Pied Puzzler online, as separate PDF files, one per article (or one big one, if you have the patience to download it). I've heard of several web pages which all begin a long series of puzzles. These include nfshost, notpron, klueless, iima-chaos, ultimo puzzle, orio's riddle, and neutral riddle. I vaguely remember a game called Press the Green Button, but I can't seem to find it now. If you know of others, please write to me. Alexandre Owen Muniz: As promised, I've done a revamp of my polyomino cover site. There are a few new results there. On Friday, I had a choice between seeing a movie about someone saving the planet, or Superman Returns. I chose to go see An Inconvenient Truth. An oil company geologist has attacked Gore's research. 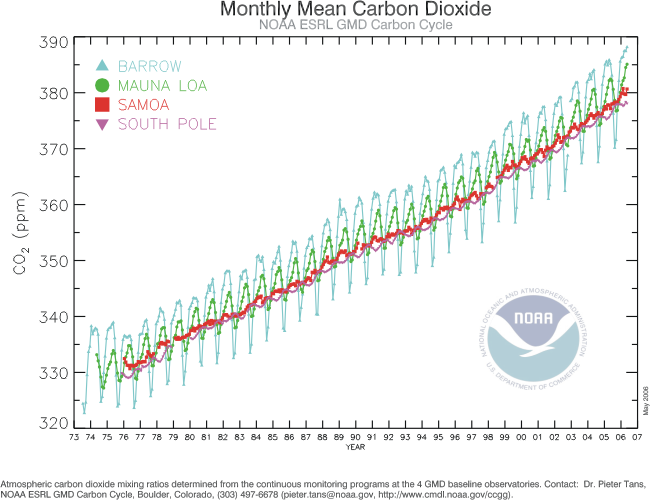 The chart of Monthly Mean Carbon Dioxide from NOAA is currently about 381 (stable link). Fluctuations in carbon dioxide levels over the past million years are primarily caused by volcanic eruptions and Milankovitch Cycles, which can lead to larger oceans. The chart below shows 650 thousand years of carbon dioxide history, up to the present day, and an extension to the near future (Linear trend: (50×Year - 89280)/29 = CO2LevelPPM). More charts. Will Shortz has been a friend of mine for 29 years now, so I should mention his movie Wordplay. Almost all of these people are members of the National Puzzlers League, which Will (Or WILLz, for WILL short Z) inducted me into 28 years ago. I know all these people -- many of them are contributors here. Somehow, a film about my friends rated a 95% on the Tomatometer, making it the best reviewed movie of the year. 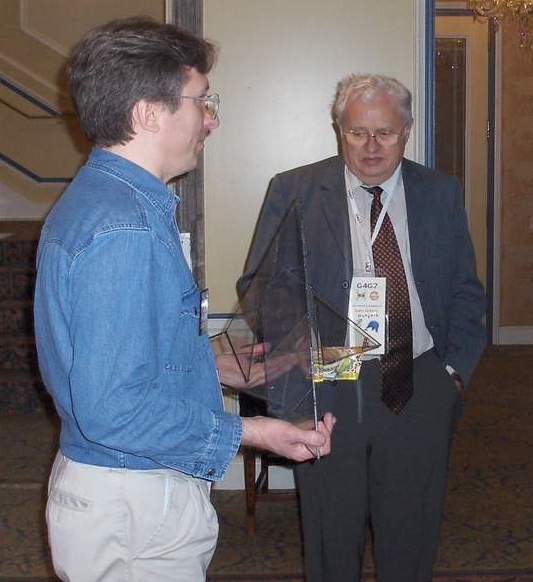 Photos of the puzzles in the 2006 Puzzle Design competition are now available. Lots of intriguing puzzles were created. One from a previous competition, which you can buy, is Sam Cornwell's Lost Luggage puzzle. The best records for Heilbronn configurations were greatly extended by David Cantrell. Erich Friedman has posted the best known solutions for circles, squares, and triangles. Cihan Altay: You have two containers with 8-liter and 9-liter capacities. Some water is in each, at given temperatures and volumes. Get some water at a temperature as close to 35 degrees as possible. No guesswork; you must be able to know what the resulting temperature exactly is. Answers and Solvers. My latest maa.org column is about Prime Generating Polynomials. The Colonel has made a lot of breakthroughs on the hexahex symmetry problem. Sand dunes can sing, under the right conditions. Song of Dunes, Singing and Booming Sand Dunes, Death Valley singing dunes, Desert USA, and Physics Web all have pictures and sound files. Anyone who read Martin Gardner's columns will be familiar with the Fairy Chess Review. George Jelliss has posted a full review at his new site, mayhematics.com. Erich Friedman: I finally figured out how to attack every square of an nxn chess board exactly once or exactly twice for n=5, 6, and 7. But i can't seem to figure out how to attack each square exactly 3 (or 4 or more) times for those values of n. Perhaps your wise readers can do it. Thane Plambeck: Hi Ed, I thought you might be interested in this Copenhagen apartment complex with units shaped like a devious packing puzzle. An incredible 64K demoscene called Che Guevara has been released by Fairlight. For more, see my column 64K or Less - The Demoscene. The problems of the 2006 Math Olympiad are available. Along with photos of the event. Stirling Chow and Frank Ruskey have written a remarkable paper on Venn Diagrams and Polyhedra. WolframTones is now a free service. If you have a Cellular Phone, put cellular automata music on it. Eric Solomon: you might be interested in the game program 'Entropy' at ericsolomon.co.uk/en/entropy.html. I produced the board game around 25 years ago, but the program is new. One player tries to produce symmetrical patterns while the other tries to prevent them. I enjoyed a recent poster by artist Roz Gibson. 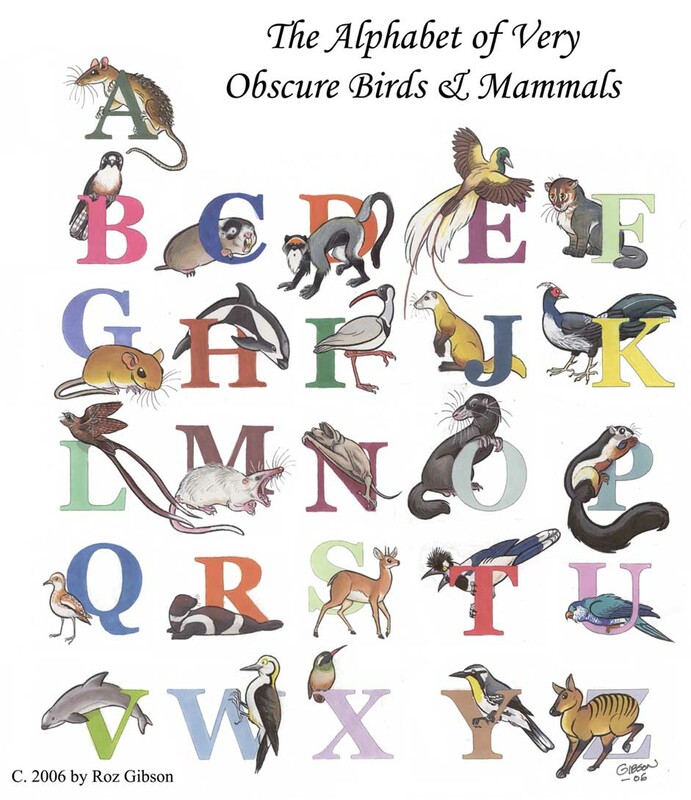 It's an entire alphabet of some of the most obscure birds and mammals in the world. Can you identify all of them? Itamar Faybish: I am organizing for the first time a chess composition tournament, The Longest Series Help-Stalemate Tournament. This tournament is the third in the series of finding the longest series help-stalemate with a specific final position. The first two were held by Jean-Marie Choreïn (with the assistance of Michel Caillaud for the first one). Some sample puzzles are at my Chess Puzzles page. Golly 1.0, an excellent cellular automaton explorer, has just been released. Now there's Python scripting support if you have Python installed. A large pattern collection with incredible pieces of Life engineering included. A star attractions is a set of "metacell" Hashing-Example patterns by Brice Due, discovered of days ago. Like David Bell's original "unitcell", these are large square Conway's-Life patterns that, when placed in a large grid, can emulate any outer totalistic CA rule. Unlike previous unitcells, these metacells change state in a way that's quite visible even at huge zoom levels, and they're optimized in size and timing so that Golly can run them impossibly quickly. The results are in for the WPC qualifier. Coming in at #1 and #2, one point away from each other, were Thomas Snyder and Wei-Hwa Huang. A full summary is available. Many frequent contributors here contributed the puzzles used int he competition. Speaking of Wei-Hwa, his latest Google Puzzle is a tricky timed maze. Andrew McFarland: Hi, just bringing to your attention some good laser puzzles. Some of the levels do not use all the mirrors, and sometimes, when all the pieces are used, one or two pieces may not be used to their fullest potential. Good puzzles nonetheless.. and knowing a little graph theory can help. In the May 2006 issue of College Mathematics Journal, page 223, Hassan Noon and Glen Van Brummelen looked at a game where players take turns placing non-attacking queens on a chessboard. The first to play a queen that attacks another, loses. For odd-sized boards, the first player has an easy win (play in the center and mirror). On the 5x5 and 7x7, there is also, ignoring rotations and reflections, a single move off the center that also wins. Can you find them? For even-sized boards up to 8x8, the first player wins, with a single winning move on the 8x8. On the 10x10 board, though, the second player wins. Nothing is known for higher order boards. The latest version of Inkscape is out. I feel that vector drawing skills are incredibly important now, which is one reason I am holding a Vector Drawing contest. As of today, one person has entered. That will certainly make judging easy. Another contest is to make an SVG logo. Would you buy a bubble from this man? The latest Wolfram Research party had a carnival theme. My own event challenged people to describe the soap film that would appear within various polyhedra skeletons. I used the Zome system for the polyhedra. The 2006 $1-Million dollar Shaw Prizes, considered the Nobels of the East, have been announced for 2006. David Mumford of Brown University made advances in pattern theory and vision research. Wu Wentsun of the Chinese Academy of Sciences advance the field of mathematics mechanization. Both will be honored at a ceremony in Hong Kong on September 12. Awani Kumar does a study of 3D knight tours in the latest Games and Puzzles Journal. George Sicherman: I've added the polyhex tri-oddities to my web site. We're still missing 6 pentahexes! Jacques Ferroul has built up a site with various new polyforms. Andrew Clarke has highlighted his Polyiapons. According to Harvard mathematics professor Shing-Tung Yau, winner of the Fields Prize in 1982, the global collaborative work for a proof of the Poincaré Conjecture is now complete. In 2003, Russian mathematician Dr. Grigori Perelman gave a series of public lectures at the Massachusetts Institute of Technology. These lectures, entitled "Ricci Flow and Geometrization of Three-Manifolds," were presented as part of the Simons Lecture Series at the MIT Department of Mathematics on April 7, 9, and 11 of that year. These widely acclaimed lectures made spectacular advances to the work of Hamilton, and led to MathWorld article Poincaré Conjecture Proved -- This Time for Real. The Perelman lectures gave a roughly 70 page guideline for a final proof. In 2006, the 300-page paper "The Hamilton-Perelman Thoery of Ricci Flow-The Poincare and Geometization Conjecture," was was published in the June issue of Asian Journal of Mathematics. Zhu Xiping of Zhongshan University and Cao Huaidong of Lehigh University co-authored the paper, which finalized the earlier work of Thurston, Hamilton, and Perelmen. Zhu and Cao spent two years writing their paper, under guidance from Shing-Tung Yau. Once completed, they then went to Harvard for half a year. Each week, they spent three hours explaining and defending their work to a team of Harvard mathematicians. After this long series of lectures and reviews, the 31 members on the editorial board of Asian Journal of Mathematics reached a unanimous consensus to publish the paper. The latest Al Zimmermann Programming contest shattered all existing records in the field of Prime Generating Polynomials. For example, one polynomial that generates 49 primes is x^4 - 97*x^3 + 3294*x^2 - 45458*x + 213589, first found by Mark Beyleveld and later by 5 other participants. Six people found this record-setting polynomial within weeks of each other! When I suggested the contest, I had an idea that there might be some easy records out there, but this is better than anything I expected. -66 x^3 + 3845 x^2 - 60897 x + 251831. Prime for x=0 to 45. Ivan Kazmenko and Vadim Trofimov. 42 x^3 + 270 x^2 - 26436 x + 250703. Prime for x=0 to 39. Jaroslaw Wroblewski and Jean-Charles Meyrignac. x^4 - 97x^3 + 3294x^2 - 45458x + 213589. Prime for x=0 to 49. Mark Beyleveld. (x^5 - 133 x^4 + 6729 x^3 - 158379 x^2 + 1720294 x - 6823316)/4. x=0 to 56. Shyam Sunder Gupta. x^5 - 99x^4 + 3588x^3 - 56822x^2 + 348272x - 286397. x=0 to 46. Jaroslaw Wroblewski & Jean-Charles Meyrignac. (x^6 - 126 x^5 + 6217 x^4 - 153066 x^3 + 1987786 x^2 - 13055316 x + 34747236)/36. Prime for x=0 to 54. Jaroslaw Wroblewski & Jean-Charles Meyrignac. The New York Times has a nice article on David Krumholtz and his work in Numb3rs. Miguel Berrocal, maker of many famous puzzle sculptures, has died at age 73. A translated news story is available. A gallery of Berrocal's works is available at John Rausch's Puzzle World. Many people, including me, believed that Sam Loyd created the 15 puzzle. Sam was responsible for many frauds, but I assumed that wasn't one of them. Jerry Slocum's latest book, The 15 Puzzle, sets the record straight. Martin Gardner: "Jerry Slocum and Dic Sonneveld have written an amazing tour de force. It covers in fantastic detail the history of the greatest mechanical puzzle craze ever to sweep not only the United States but also England and Europe. The Rubik’s Cube mania was modest in comparison. Did Sam Loyd, America’s greatest puzzle maker, invent the notorious 14-15 sliding block puzzle? He claimed he did but the claim was a total lie. Loyd had nothing whatsoever to do with either the puzzle or its popularity. The research done by the two authors is awesome. It is a book hard to put down." Jerry's book documenting Sam Loyd's skulduggery is excellent. 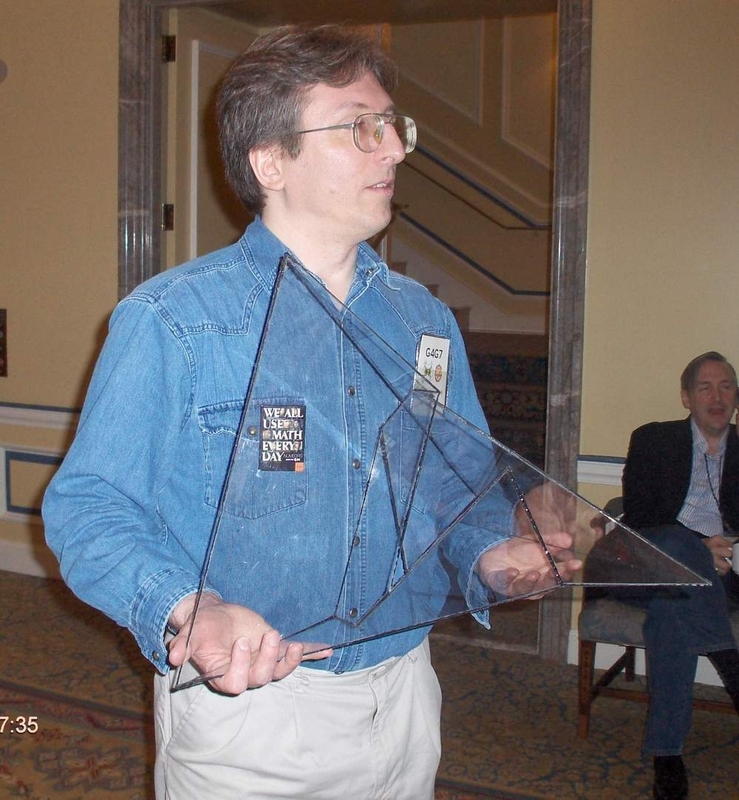 Ironically, on April 1 Jerry won the AGPC Sam Loyd Award, one of puzzledom's highest honors. 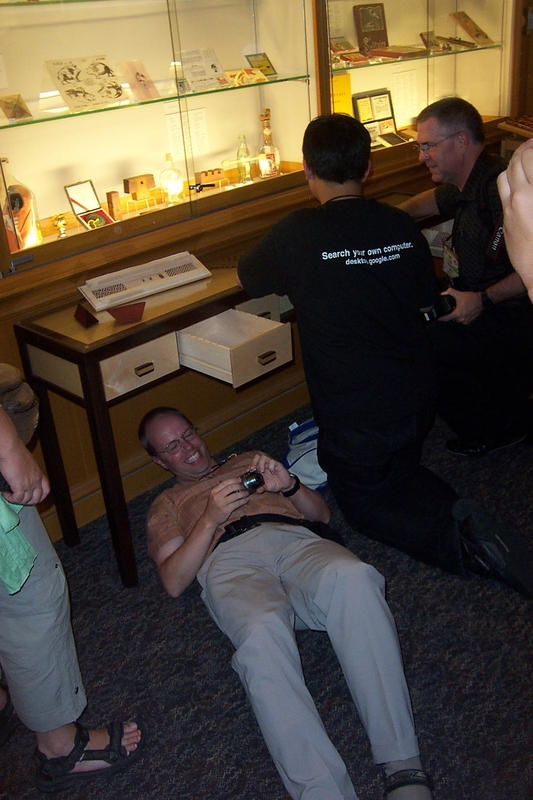 The DaVinci Code puzzle challenge was very popular, and has now morphed into Wei-Hwa's Puzzle Challenges. If you have a customized Google page, you can visit googlepuzzles and click the Add to Google button. His latest puzzle is based on Erich Friedman's Distance puzzles. Dave Millar has posted 18 pages of puzzles at The Griddle (.net). Probably the best collection of 4x4 themed puzzles with stars ever assembled. I've mentioned Matt's Puzzle Corner before, when he made some chess sudoku puzzles. His book Chessudoku is now available. Matt tells a story with before each variant, with the major characters being the White Queen, the Black Knights, and so on. A lovely book - a free PDF preview is available. Back when I was helping with the Periodic Table Table, one of the difficult elements was Rhodium. It's the rarest of all the non-radioactive elements, on par with Iridium. Back then, in 2003, it was $380 an ounce. Now, it's $6000 an ounce. I sure wish I'd bought more. Writer Oliver Sacks long had a desire for a slab of Iridium, and obtained one. His whimsy wound up being a tremendous investment. For more elemental fun, Popular Science has devoted a webpage to Theo Gray's Chemistry Columns. The latest issue of popsci had this quote from the American Institute of physics. "We were off by 39 orders of magnitude: in PNU 775, the RHIC (Relativistic Heavy Ion Collider) peak energy density achieved is 15 GeV per cubic femtometer, not per cubic centimeter." 39 orders of magnitude is the difference in volume between the sun and a grain of sand. Stan Wagon sent a long letter to his Puzzle of the Week list about various fascinating papers he's placed on stanwagon.com. He also expressed kudos for one of my favorite site, Grand Illusions. Mahmood Saghaei: Having in mind the sudoku game I tried to do the same with a completed knight tour and the result was XKnight Game. XKnight is a new game based on knight's tour problem. It is a completed knight's tour in which as many squares as possible have been cleared provided that the resulted incomplete board has only one valid solution. Therefore the object of the game is to find the missing squares (Move numbers). I'd like to see what sort of math diagrams people are capable of. So, I am kicking off my first Vector Math Poster contest. Depending on the number of entries received, the first prizes will be anywhere from $100 (if less than ten people enter) to $500 (if more than a 100 people enter). There is one major rule -- your submission must be entirely in Vector format. If it uses any raster material at all, it's disqualified. Other than that, it should be a single page Math poster, suitable for hanging up in a high school or college math room, or suitable in a background in Numb3rs, or usable as part of a background screen or slideshow. Preferably all 5. The poster should have have some manner of math illustration or illustrations in it, along with a good explanation of the concept. If you use a reference, note the reference on your poster. Final deadline is August 1. Send me your math posters! Both TpX and Inkscape might be useful. The formats I prefer are SVG (favorite), PDF, EPS, DXF, AI, EMF, SWF (in that order). If you'd like to be in the competition for the next US Puzzle Champion, visit http://wpc.puzzles.com/ before June 15. The actual test will occur June 17. There are 5 excellent puzzles in the practice test. Another $500 contest is to make a political cartoon concerning the abuse of science. Sponsored for the Union of Concerned Scientists. For those of you needing a 5 dimensional challenge, you can try 5D Rubik's cube. Here's a photo of me (denim shirt) with a Szilassi polyhedron, next to Dr. Szilassi (suit and tie). Here's another of just me (boy do I look tired). The builder of the object was Hans Schepker (who can make anything in glass). Photo by Sándor Kabai. 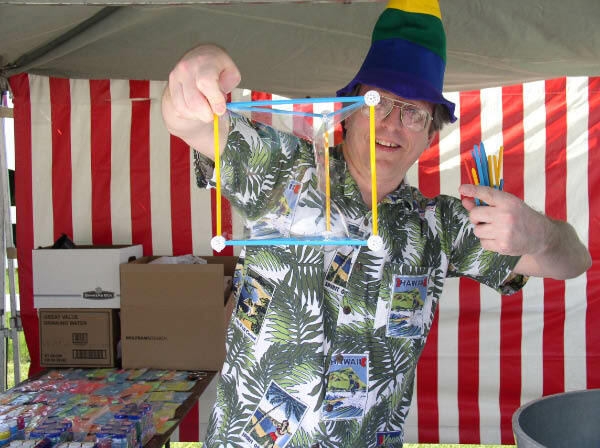 I touch on this polyhedron in my lastest maa.org column on the Fano plane. We met at G4G7. Serhiy Grabarchuk has posted a page of Puzzle Classics, all with new twists. At the moment, the top problem for the next Al Zimmermann contest is Zigzag Paths, based on Serhiy Grabarchuk's Matchstick Snake problem. There are many other interesting problems also being considered. Oddly, the other leading contest is Protein Folding, which could also be described as a "snakes on a plane" problem. The flash game 3D Logic challenges you to make snaky connections on the surface of a cube. In the United States, the teaching of science and chemistry is being heavily sanitized. A recent Wired article starts with the owner of United Nuclear being arrested by the FBI, for selling common chemicals. Based on a recent 41-cell construction by Bill Gosper, Nick Gotts produced a pattern with only 26 ON cells that exhibits O(t ln t) growth. Hartmut Holzwart recently constructed some strange patterns that look like inside-out spaceships. Noam Elkies and I put together a 2c/3 signal transceiver -- a device capable of transmitting information along a specially-designed diagonal "wire" at two thirds of the speed of light. Gabriel Nivasch put the finishing touches on a Caterpillar -- a spaceship that travels at 17c/45. Erich Friedman's latest Math Magic concerns tetromino games. Each player has lots of copies of a particular tetromino, and alternate playing on a rectangle. Who wins the game? He presents several interesting cases, and asks for larger solutions. Robert Abbott has a multi-state maze on the cover of GAMES Magazine. I just got my copy, so it should be on newsstands now. The cover shows a network of pipes to travel through. At each junction you must exit on a pipe at the upper left or upper right of the junction. At various times, you turn the magazine 90° clockwise. That changes where upper left and upper right point, and it is what makes this a multi-state maze. At each junction you are in one of four states, depending on the current orientation of the magazine. Funny story behind my domino sudoku in Scientific American -- the domino placements were accidently left out in the printed puzzles. Fortunately for me, this wound up making it a much harder and much better puzzle. White to play, and win a piece in 516 moves. Black's best move in the following position is Rd7+. After that, White can force a win in 516 moves. Marc Bourzutschky: The ending kqnkrbn contains maximal lines with 517 moves. This was a big surprise for us and is a great tribute to the complexity of chess. The database was generated with Yakov Konoval's program. Generation and verification took a little over a month on a 3.8 GHZ machine. Yakov and I had thought it so unlikely that any 7-man ending would require more than 511 moves that we had hard-coded 511 in a number of places. ... Returning to kqnkrbn, the 517 moves continue the trend of more than doubling of depth for each additional piece added: krk=16, kbnk=33, knnkp=82, krnknn=243, kqnkrbn=517." From Physics News Update 778. Having traveled far beyond the planets in their 28.5-year journey, the two Voyager spacecraft are providing new information on the heliosphere, the teardrop-shaped bubble that separates the solar system from interstellar space. At this week's Joint Assembly Meeting in Baltimore of the American Geophysical Union (AGU) and several other geophysics-related societies, Ed Stone of Caltech reported that the heliosphere is deformed, according to Voyager observations, with the teardrop's rounded edge bulging at the top (the northern hemisphere of the solar system) and squashed at the bottom (the southern hemisphere). Pictures and movies at nasa.gov. Rafael Millán: We have not talked before, but I have had many good times reading your math games and puzzles pages, for instance your magnetic spheres article. Not using magnetic spheres, but magnetic rods and normal steel spheres, all Platonic, Archimedean, and Johnson solids can be built, and also many more interesting figures. I am beginning to publish a related site (Geomag Polyhedra). 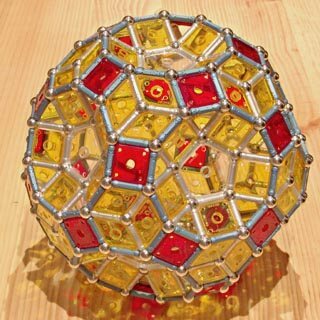 I like most the pages related to the rhombicosidodecahedron, which is perhaps the most productive of these objects. I use the Geomag system, which uses just one rod length. This is a challenging restriction, but it is also a stimulating one, which also feels very "mathematical". Jeff Tupper: Tess lets one play with tessellations and a few types of orbifolds (tori, bi-infinite cylinders, infinite cones, and planes; & hopefully more in the future). We've just had our 2006 Tess contest & I invite people to come by our site in a few days to see the winning entries. Many very good entries were sent in. In a couple days the date will be 06-06-06. For various math facts on 666, see Mike Keith's 666 site. The latest Ponder This by IBM asks for the average number of vertical alignments in a 2 by n strip of dominoes.